If you wanted the best money could buy, Stromberg-Carlson radios were sought out for their unmatched performance and beauty. Imagine it is 1940 and your family is anxious to hear the latest news on the war in Europe and Franklin Delano Roosevelt's messages. 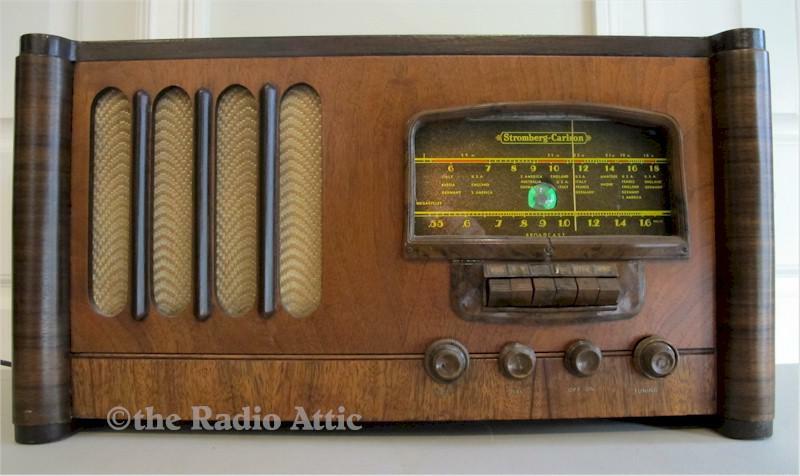 This mammoth radio had all of the power needed to reliably find signals from across the globe. The cabinet is a near perfect original with beautiful veneers. It has been restored to electronic perfection and it a fabulous receiver even by today's standards. As with most radios from this era that used Tenite plastics for the dial escutcheon, some shrinkage and a small stress crack can be seen in the photo. I've never seen a nicer example of this radio. This big brute weighs 25 pounds and measures 22"W x 11-1/2"H x 9"D.